Updated Monday February 9, 2015 by Trabuco Canyon Little League. 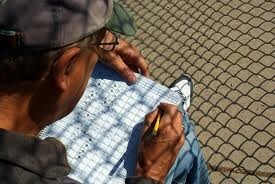 Much like an umpire, manager and coach, the game of baseball cannot exist without scorekeepers. It is a very important job. Here are a few things to remember when you are scheduled to be scorekeeper for your son's or daughter's game. Scorebooks are in the cinder-block closet. Be sure to grab the correct book based on level (AA, AAA, or majors) and field number. For juniors and seniors, the scorebooks are in shed. While there is a small supply of pencils with the scorebooks, you should always bring a couple from home. A mechanical pencil, or two, are suggested. Once the lineups are exchanged at home plate, you work for the plate umpire. He is the only one you should talk to between the fence. If a coach or manager has a question for you, they should always be directed to the plate umpire. After the pre-game plate meeting, the umpire should provide you a lineup card and the pitching log for both teams. At a minimum, lineup cards must include the following: 1) last name of players in batting order with jersey number, 2) pitcher and catcher noted, and 3) league age for each player. One of the most important aspects of keeping score is keeping track of the pitch counts and score, and being able to recreate the game if there is a protest. If a protest is submitted, the first place we will look is the scorebooks, and this is where we will try to recreate the game. Between innings or during a pitching change, you should provide the pitch count with the plate umpire for each team if requested. They will then provide the official pitch count to the managers. After the game, you should ensure the pitching logs for both teams are complete and match the scorebook. Then, the umpire signs both. The pitching logs can then be delivered to the managers. While a lot of responsibility comes with being a scorekeeper, it is a lot of fun and a very rewarding job. What better way to spend the afternoon or evening watching your son's or daughter's game while taking an active part in the game by scorekeeping.